This elephant will never forget the day it was part of a jumbo rescue mission after being dragged out to sea by strong currents. An elephant was rescued after it was found swimming more than nine miles off the coast of Sri Lanka. The creature had been dragged into the open sea by a current, the country's Navy said in a statement. One of its fast attack craft found it during a routine patrol, the force said, adding that a second craft and a team of divers had been dispatched to the sea off Kokkuthuduwai, Kokilai. 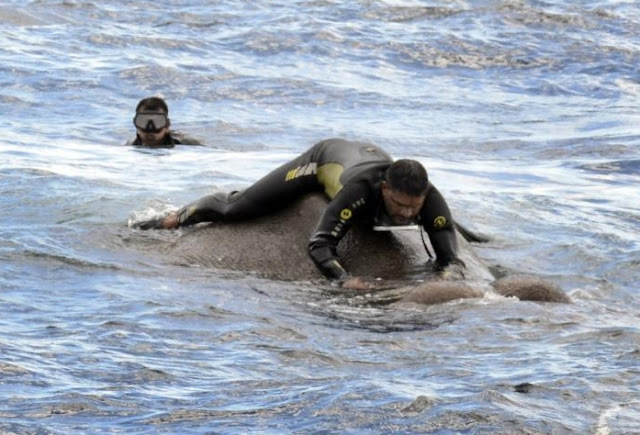 Using ropes the rescue team were able to guide the pachyderm back to shore, the Navy said. "A group of officials from the Department of Wildlife also joined this humongous task providing necessary instruction which became extremely vital in the rescue mission," they said in a statement. "Accordingly, they were able to carefully direct the elephant towards the coast from the deep sea, by means of ropes. "Having safely guided the elephant to the Yan Oya area in Pulmodai, the animal was handed over to the wildlife officials for onward action." Avinash Krishnan, of conservation group A Rocha, told The Guardian: "Swimming about 15km from the shore is not unusual for an elephant. "[But] they can’t keep swimming for long because they burn a lot of energy." Responses to " Sri Lankan Navy rescues drowning wild elephant found in the middle of the ocean"
Thank you for posting some feel good stuff the last few articles were so sad! Well done ''Sri Lankan Navy'' you all deserve medals.